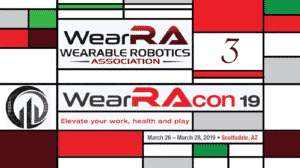 The Wearable Robotics Association third annual Wearable Robotics Conference, WearRAcon18, was off to a magnificent start with impressive keynote speakers, exciting hands-on exoskeleton demos, and industry-shattering announcements. The full count isn’t in yet, but it appeared like the first day of WearRAcon18 had higher attendance than any previous years. 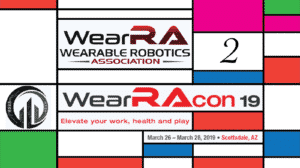 After breakfast, Joe Hitt, the Executive Director of the Wearable Robotics Association (WearRA) officially kicked off WearRAcon18 with a singular message “Your Life.” This technology is about the people it serves. Exoskeletons have the potential to touch millions of lives, from a paralyzed person standing up to receive a certificate to a worker that can avoid a debilitating injury. Marketing, getting the word out regarding companies and products that are already in production. Advocating for wearable robotics in front of user groups and regulators. 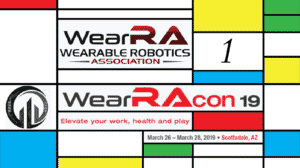 The Wearable Robotics Association announced that it will create the first ever “Wearable Robotics Listing.” Companies in the wearable robotics industry will receive a WR number and become listed by WearRA. 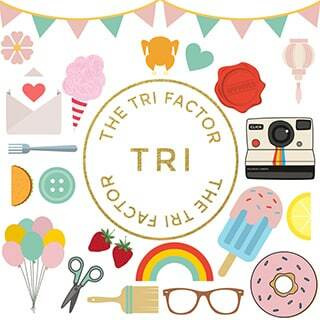 Each company, its specialties, and products will be outlined and published by the association. The numbers will be assigned on a first come, first serve basis. 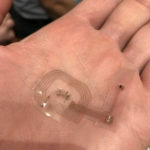 Soft, body-integrated electronics for wearable robotics was the topic of choice for Professor John Rogers from Northwestern University. Wearable robots work only as well as the information that they are able to collect on the user. Limitations on modern sensor technology are an obstacle. 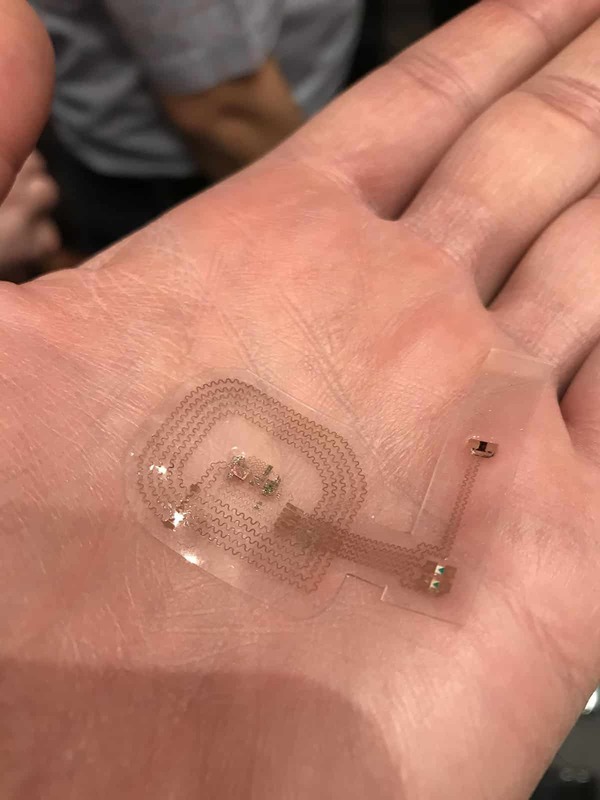 Dr. Rogers is working on moving away from a “rigid block of electronics strapped onto the body.” His goal is to develop a flexible, thin, and permeable electronics with a skin interface. One solution is to start with a thinly sliced silicon chip which is then folded to produce a flexible structure. 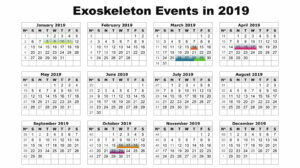 Some applications include, but are not limited to exoskeleton control, motion analysis for exoskeleton evaluation, and collection of data without having to rely on heavy modules and equipment. The Ekso Bionics team followed up the first keynote speech with a strong spotlight demo of the EksoWorks Vest. 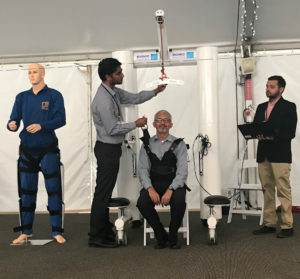 The presentation marked a cultural shift for the exoskeleton industry by finishing the demo with “we want everyone in the tent to try it out.” In just two years, manufacturers attending WearRAcon have shifted from “don’t touch” in 2016, to “maybe some can try it out” in 2017, to “we want everyone to try it out” in 2018. This was a repeating theme throughout the day. Hopefully, this is a sign of the exoskeleton industry starting to become more open and collaborative. After all, a person can learn a lot more by trying out a wearable device, even if just for a few minutes, compared to being limited to videos and articles. The second major announcement of the day came courtesy of Ben Wolff, the CEO of Sarcos Robotics. 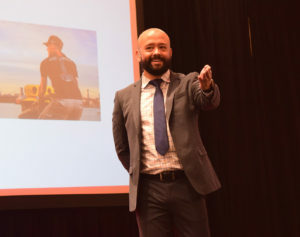 He outlined the short term vision and new product line for the company but emphasized an issue that hinders the entire exoskeleton industry: the media presents machines and automation as something that is coming to replace people, rather than something that can work in tandem with them. An issue that is not being discussed as much is the aging workforce in the US, Japan, and most of the E.U. The major announcement came at the end of Ben Wolff’s presentation: Sarcos has formed X-TAG: an industry focused exoskeleton technical advisory group. 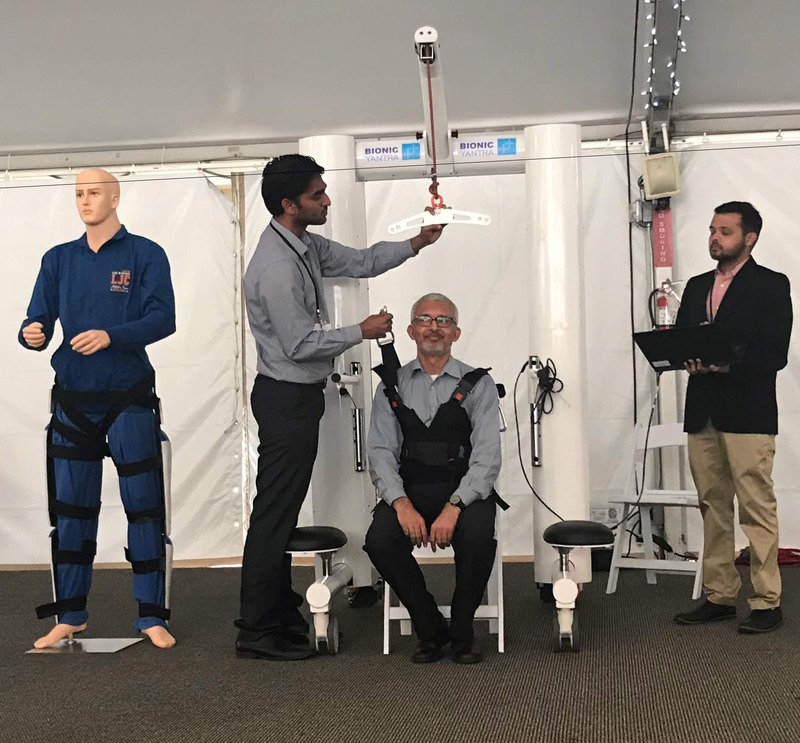 X-TAG is an assembly of executives across manufacturing and oil & gas working with Sarcos and industry groups to identify powered and quasi-passive full-body exoskeleton solutions for the workforce. 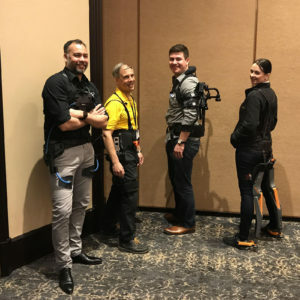 The company also published a full press release to coincide with the WearRAcon18 announcement (see: Sarcos Teams with Leading Industrial Innovators to Form Exoskeleton Technical Advisory Group). Dr. Devjani Saha transitioned the audience from industrial exoskeletons to medical wearables with practical suggestions on reducing the cost and speeding up market clearance in the U.S. Her top suggestion? Contact the FDA directly prior to launching any clinical studies to see how they fit the device claims and if they will provide the proper justifications. Look for her presentation on the WearRA website coming soon. The third major announcement for the day was an exclusive reveal by prosthetics giant Ottobock that they will enter into the passive industrial exoskeleton market! The audience was stunned, as Ottobock is primarily a medical company and it appears that they had kept their research and prototype work well guarded. 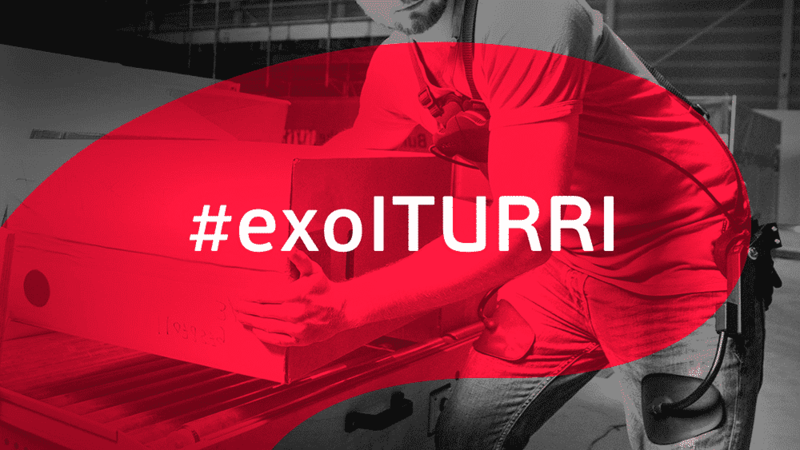 Without a doubt, this introduces a seismic sized shift in the exoskeleton industry, but more on this at a later time. All of this action occurred before even hitting the lunch break! The rest of the day was followed by multiple “Breakout” sessions where the attendees could choose between a “Logistics” or a “Medical” path of presentations and demonstrations. In the meantime, the main booth area was alternatively stocked with water, tea, cookies, and appetizers to keep everyone running on full steam, followed up by a welcome reception. Major exoskeleton companies such as Noonee and Ekso Bionics brought practical, hands-on demos. NIST had even shipped a section of a sample exoskeleton test course and a poster describing its intended use. The last spotlight demo was run by Bionics Yantra, an Indian company aiming to bring accessible physical rehabilitation to India. 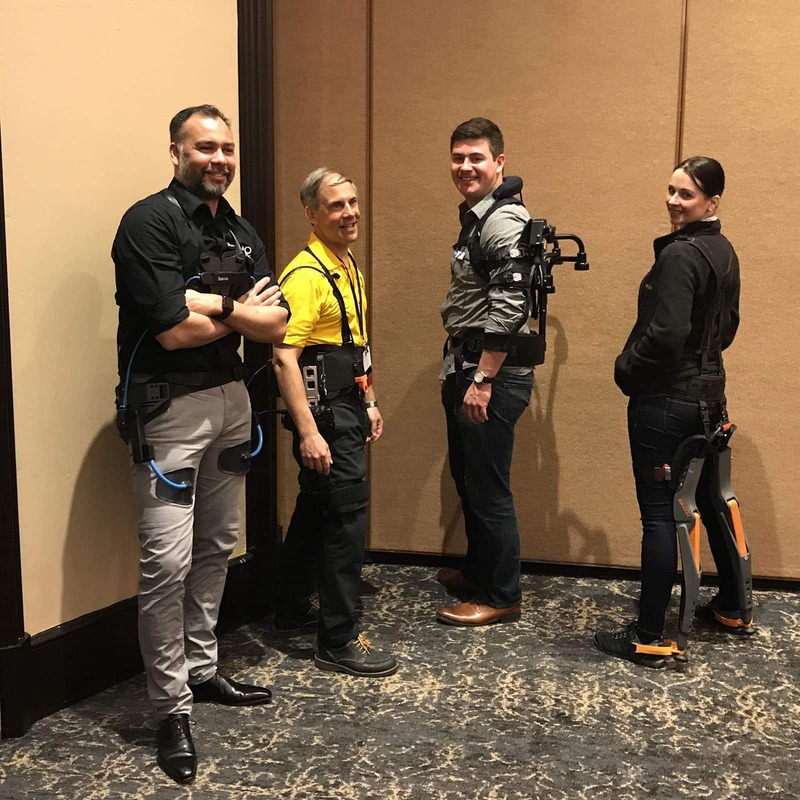 Bionics Yantra had gone from a small team with nothing but an idea put on paper at WearRAcon17 to a functional prototype of an automatic body support assist harness and frame that can follow the user; their gait assist exoskeleton will come next. 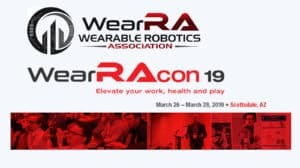 If the first day of WearRAcon18 is to be any indicator, the exoskeleton industry has a bright future ahead of it. How about some updates on what Myomo had to share?! The CEO of Myomo, Paul Gudonis participated in a session on the international perspective of medical and rehabilitation wearables. Unfortunately, or fortunately, there were so many hands-on demos this year that it was impossible to attend all of the breakout sessions. When can we expect to see Dr. Devjani Saha’s presentation? A week, a month? Hello, Dr. Saha’s presentation is in the hands of the Wearable Robotics Association. The conference attendees working on medical devices liked her practical approach.